Powers/Abilities: EL VALIENTE'S powers fall into 3 categories. When El Valiente perished, benevolent aliens resurrected him and bestowed upon him different powers, some obvious and others hidden. They only intervened because they felt a great loss was about to occur to humanity if El Valiente died. 1st power(s) is the obvious one, super strength, endurance, and agility which lead his enemies to underestimate him when El Val uses his other powers. His strength is on level with the Hulk, and like the Hulk in some respects, the more punishment El Valiente receives, the stronger he becomes. His endurance rivals that of Superman's toughness; he could take a full on punch from the Big Red S and although it would probably knock him out, it wouldn't kill him. His agility equals Captain America or Spider-Man, although El Valiente cannot fly, he can leap tremendous distances, These are El Val's "meat-head" powers. 3rd power is a hidden power that El Valiente is not aware of and which is probably his most valuable. This is the power of serendipity, meaning the chance ability to change a situation through opportunity. For example, a stalagmite sticking out of the ground, and El Val is fighting off a vampire, he picks up the vampire and slams him on the stalagmite piercing its heart and killing it. Different situations will present different opportunities for this power to manifest itself. There are other powers which have yet to be revealed. History: A terrible tragedy befell El Valiente early in his career that shaped him into the hero he would become. Valiente was murdered in the ring by an agent working for his arch-nemesis Professor Terror. Professor Terror has sworn a vendetta against the hero for something that occurred in both of the men's past, this has something to do with the tragedy that haunts El Val to this day. Like Moriarty to Sherlock Holmes, Professor Terror is both EL Valiente's greatest ally and greatest enemy. Resurrected by benevolent aliens, El Valiente has become a crimefighter and monster hunter, the sworn protector of El Paso, TX. El Valiente keeps a vast library and databank of all the monsters he has encountered, he is an avid collector of apocrypha and seeks out old texts to better his knowledge of those monsters he has vowed to vanquish. Comments: Created and written by Ray Ramos, and illustrated by Elmer Pasaoa. Thanks to Ray Ramos for providing the above profile. 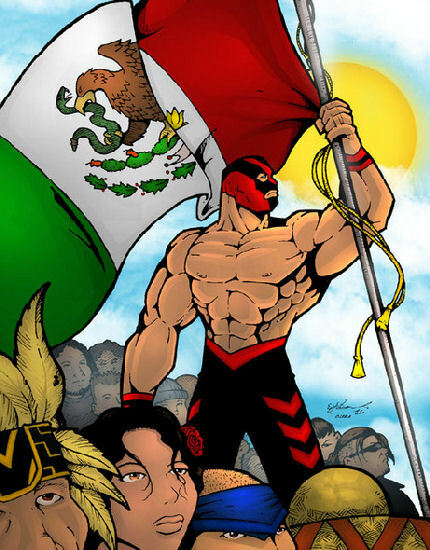 El Valiente will be appearing in the War of the Independents.